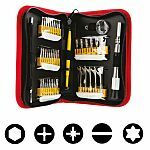 Screwdriver sets are the most common tools used by professionals and DIY enthusiasts. 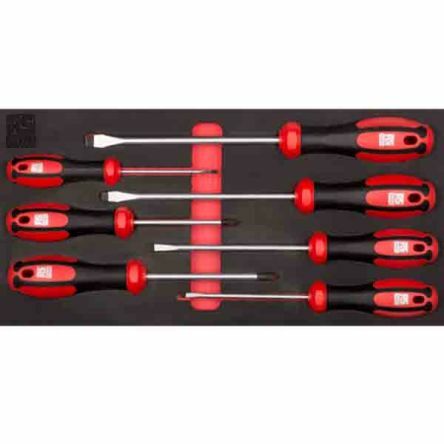 Screwdrivers are hand held devices use to install and uninstalling fasteners or screws. 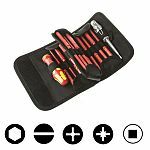 Screwdrivers rely upon the physical strengths of the operator to deliver accurate force when turning clockwise or anti clockwise via screwdriver handle. 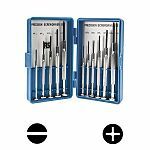 We offer a range of screwdriver sets from VDE, Interchangeable, precision and electronic. 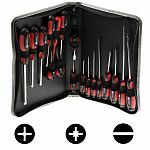 The different types of screwdriver are primarily down to the drive tip shape required for a specific head type of a given screw. 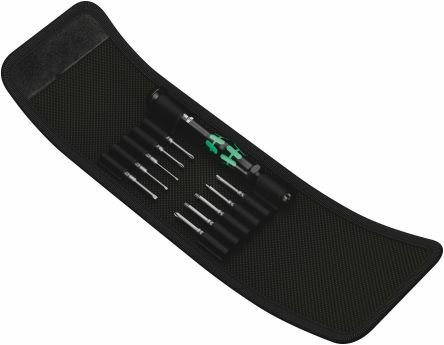 However, we offer a range of screwdrivers that are application specific. 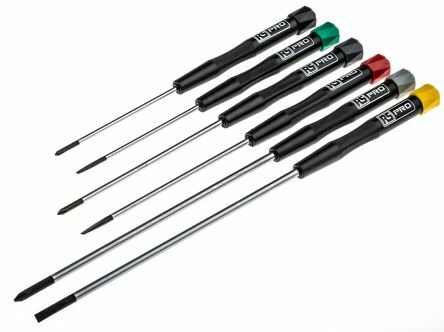 The screwdriver handle which is used for gripping has changed material over time and has increased in variety for different applications. The handle is generally shaped to prevent rolling on flat surfaces and can also be ergonomic to improve comfort when gripping. 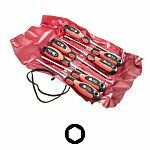 Most commonly the handles are made of a composite of hard plastic such as cellulose acetate and rubber and can be covered in a soft material such as a thermoplastic rubber to improve grip. 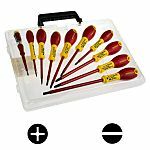 The screwdriver shaft or shank is commonly made of strong steel to ensure that bending or twisting deformation does not occur when applying force. The shaft is rounded or has a hexagonal shape so that a spanner or wrench can be used to apply increased torque. The shaft is generally different colouration and material to the drive tip which can be interchangeable. Do not hold the screw in one hand while using the screwdriver. If the screwdriver slips out of the slot you run the risk of serious hand injury. Never use an incorrect screwdriver on screws, there is a high probability that you will damage the head of the screw making the task of removal even greater. Always use the right tool for the right job. 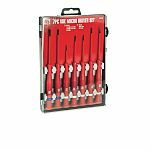 Direct replacement screwdrivers are available for certain brands, please browse our Screwdrivers. 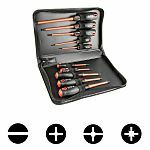 Screwdrivers and Screwdriver Sets are used by electricians, engineers and mechanics, they are a vital component during assembly of furniture, mechanical repair or general maintenance around the home.